We're a family-run business and pride ourselves on our friendly, personal service. Our directors Paul and Malc are personally involved in the day to day running of the business; Paul is also our resident mechanic, maintaining our fleet from the on-site workshop. Their wives Dawn and Mel are responsible for operating our telephone and booking system, organising our fleet and travel arrangements. Nicky runs our office and the business side of the firm, handling any accounts work. All staff are DBS checked, MiDAS trained, hold a CPC driver's card and are NVQ qualified to level 2. We have invested in staff training to ensure we can provide the best possible service for our customers. Transport is available on a one-off or contract basis. We have a team of courteous, professional drivers (female drivers available on request). All drivers are safe and reliable with good local knowledge. Remember, our service is available 24 hours a day for pre-booked bookings, so even if you have a late or early flight, you can count on us! 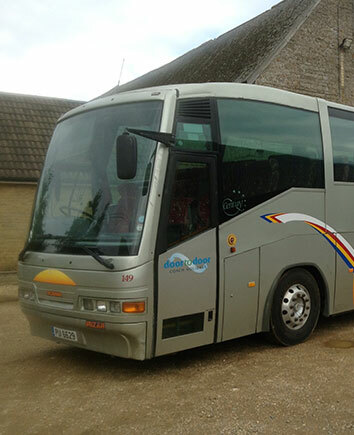 Transport is available for parties for both small groups and up to 70 plus!. Click here to learn more about our fleet. To book your journey with Hayletts Private Hire Ltd, get in touch today.